Reiki (pronounced RAY KEY) is the channeling of universal life force energy to promote healing. A Japanese healing arts tradition, "Reiki" is made up of "Rei", which means "universal", referring to the spiritual dimension of the soul; and "ki", the life force energy that flows through all living things. Reiki is a laying on of hands healing technique. Thought to have originated with Tibetan Buddhists, it was rediscovered in Japan in the 1880´s by Dr. Mikao Usui. During a Reiki treatment, healing energy flows from the Universal Source, through the Reiki practitioner to the client. Reiki energy is by definition gentle, benign, and intelligent. It will go where it is most needed in the body to promote physical, mental, emotional, and spiritual healing. Receiving Reiki feels a lot like what people sometimes call "caring" or "love". Dogs are a natural match for Reiki, because they automatically recognize and seek out sources of positive feeling. If we laugh, they become energized, wag their tails, even start to bark or lick our faces. If we praise them and cheer them on, they will repeat the desired behaviors over and over. When dogs feel the energy in a Reiki practitioners´ hands, they quickly gravitate to it, and the practitioner can often feel them soaking it up, sponge-like. Before treating others, Reiki practitioners go through rigorous training to learn to attune themselves to the energy of the Universal Source. It is a demanding discipline, and there are three separate "levels" of skill which students must master over a period of time in order to become Reiki Teachers. 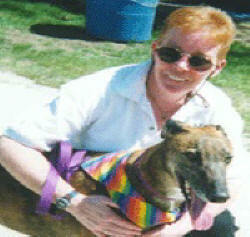 Aileen D´Angelo RMT, is our Doggie Den practitioner. She is a Registered Reiki Teacher and Practitioner (RMT) with the International Association of Reiki Professionals. She has a long history of working with and caring for animals, and has done Reiki treatments with since 1996. Before that Aileen was a veterinary technician, then a graduate of the Shallowbrook Equestrian Center. She is also a skilled animal communicator. To contact her, fill out the wellness appointment request form; or call 508-393-6970, and speak to Susan. A 30-minute Reiki session costs $35, either at The Doggie Den or in your home (if you live within 20 miles of The Doggie Den). To schedule Reiki Treatments with Aileen D´Angelo RMT call us at 508-393-6970 or use our online registration form.